The first trimester begins on the first day of your last menstrual period and is considered to finish at the end of the thirteenth week. It is a crucial time in your pregnancy, during which the baby’s major organs are formed and external physical features develop. Your body also undergoes an extraordinary amount of changes, most of which you will not be aware of. Despite this, by the end of Week 13, you probably still do not look pregnant, and the only change that might be noticeable to others is that your breasts have become larger. Initially, your pregnancy is supported by hormones alone until the placenta takes over towards the end of the trimester. 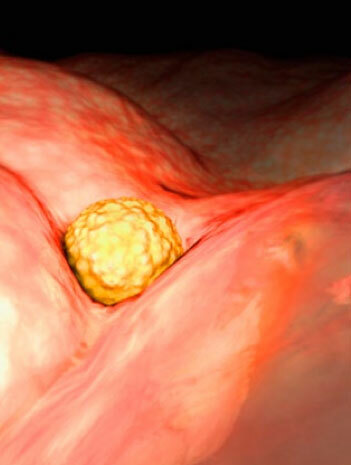 Six days after fertilisation, the blastocyst attaches itself to the endometrium (lining of the uterus). This is called implantation. While the outer (trophoblast) part embeds further into thelining, the inner cells continue to multiply and form what is now an embryo. By the end of the first week after fertilisation, cells that will become the brain and the central nervous system are already starting to develop. The gestation (length) of your pregnancy is calculated fromthe first day of your last menstrual period, so for the first two weeks, you are not actually pregnant. However, your body is preparing for ovulation as part of your normal monthly cycle. 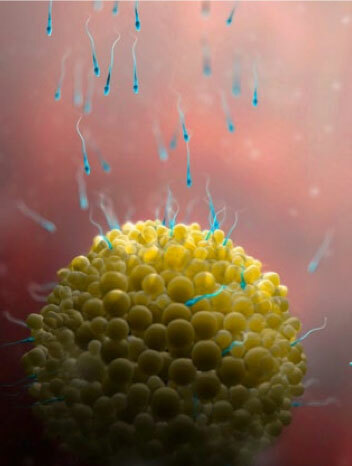 If an egg is fertilised, on or around Day 14 of your cycle, the levels of pregnancy hormones – notably oestrogen, progesterone and beta human chorionic gonadotrophin (BhCG) – are raised. Even before your period is due and you know you are pregnant, these (and other) hormones are already at work, maintaining the pregnancy until the placenta is sufficiently developed and can take over towards the end of this trimester. See Box opposite for more on the roles these hormones play in your pregnancy. It is not uncommon to experience a small amount of bleeding at this time, caused by implantation. It is much lighter than your normal menstrual bleeding, however, and happens a little earlier than your period would have arrived. The embryo is now completely embedded in the endometrium and a primitive circulation has been established. This tiny structure, which can be seen under powerful magnification as a little bump in the surface of the uterus, measures just 2 mm (see picture). You are already four weeks pregnant by the time your period would have been due. Other than a missed period, most women do not necessarily have any symptoms of pregnancy at this early stage. Some say, however, that they feel different – this may be a feeling of calmness, fullness or some other, indefinable, sensation – or that they simply ‘know’ that they are pregnant. If you have become pregnant following assisted conception, the date that you had your embryo transfer (whether frozen or otherwise) is counted as Day 14 of your pregnancy, and all your pregnancy dates thereafter will be calculated on that basis. your breasts, which usually causes them to feel tender in these early weeks (see p.126). This tenderness should disappear by the start of the second trimester. BhCG is a hormone that occurs almost exclusively during pregnancy. It is secreted by the cells of the implanting egg and later, at a lower level, by the placenta. Like oestrogen, it also helps to keep the embryo embedded in the endometrium. Secretion of the hormone rises sharply in the first few weeks of pregnancy and peaks at around Weeks 8–10. BhCG also stimulates the thyroid gland to produce a hormone, thyroxine, which speeds up your metabolism by 10–25 per cent during pregnancy. This rise in metabolic rate is needed because many of your organs increase in size during pregnancy and they need more oxygen to function well. In order to meet this need, the volume of plasma (the watery fluid) in your blood increases rapidly. The volume of oxygen-carrying red blood cells also starts to rise during the first trimester, albeit more slowly, and this ensures that the blood does not become too watery. In fact, your overall blood volume increases, from around 3.5 litres at the start of your pregnancy to around 5.4 litres by the end. Progesterone plays a vital role in regulating these metabolic changes. In order to accommodate the increased blood volume, higher levels of progesterone encourage blood vessels to dilate, which prevents your blood pressure from reaching dangerous levels. Progesterone also thickens the cervical mucus so that a protective plug is formed, which stops any bacteria entering the womb during pregnancy and causing an infection (see Chapter 6, p.156). 5 Technology Park, Colindeep Lane, Colindale, London, United Kingdom, NW9 6BX.